For most people the global war over genetically modified foods is a distant and confusing one. A handful of corporate 'life sciences' giants, such as Monsanto, are pitted against a worldwide network of anticorporate ecowarriors like Greenpeace. The companies claim to be leading a new agricultural revolution that will save the world with crops modified to survive frost, drought, pests, and plague. The greens warn that 'playing God' with plant genes is dangerous. It could create new allergies, upset ecosystems, destroy biodiversity, and produce uncontrollable mutations. In FOOD, INC., acclaimed journalist Peter Pringle shows how both sides in this overheated conflict have made false promises, engaged in propaganda science, and indulged in fear-mongering. 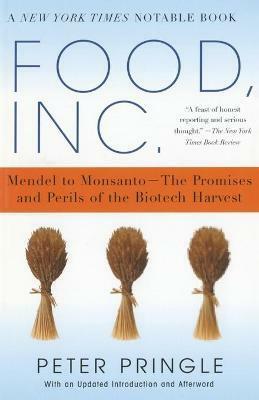 In this urgent dispatch, he suggests that a fertile partnership between consumers, corporations, scientists, and farmers could still allow the biotech harvest to reach its full potential in helping to overcome the problem of world hunger, providing nutritious food and keeping the environment healthy. George McGovern Peter Pringle, one of our most respected and perceptive authors, has given us the best book available on the complex and important matter of genetically modified foods. This book is the invaluable work of a dedicated craftsman in search of the truth behind the superheated rhetoric -- pro and con -- of the raging scientific food controversy. Robert M. Goodman Professor of Plant Pathology, University of Wisconsin-Madison Peter Pringle presents the most comprehensive and lucid account yet of the history, science, and politics of food made with genetic engineering. Along the way he tells many fascinating stories, among them an account of the great Russian botanist N. I. Vavilov and how his massive food-crop seed collection came to be spared from Hitler's bombardment of Leningrad. Matt Ridley Author of Genome Peter Pringle has done the near-impossible: maintained an open mind about GM food. That makes his conclusions all the more valuable in this crucial debate. Peter Pringle is the author and coauthor of several bestselling books, including THOSE ARE REAL BULLETS: BLOODY SUNDAY, DERRY, 1972 and CORNERED: BIG TOBACCO AND THE BAR OF JUSTICE. He has been a foreign correspondent for thirty years, working in Africa, the Middle East, Moscow and Washington D.C., for the SUNDAY TIMES, OBSERVER and the INDEPENDENT. He lives in New York City.